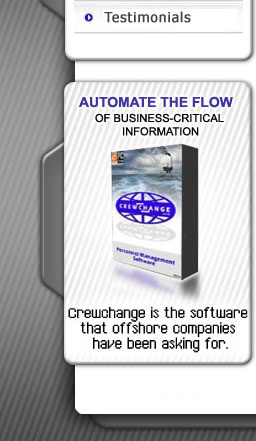 If your company is in the offshore industry, you need CrewChange. CrewChange completely handles personnel movement, management, certifications, qualifications, jobs, crews, applicants, and personnel safety record keeping all at the same time. No more white boards and markers, no more digging through personnel files, no more spreadsheets tracking certifications, no more guessing period. CrewChange allows full, intelligent management at any and all levels and departments visually and digitally. Know where your personnel are located. Track the type of personnel and applicants by job title instantly. Track all personnel certifications and requirements in seconds. Digitally store all personnel certifications and personnel photos. Create manifest rosters for your next crewchange in seconds. CrewChange allows multiple points of data entry simultaneously. Schedule and contact personnel assigned to rotating crewchanges. - And many, many more features.